On December 1, 2012, I will be exhibiting and selling my creations at the Parcells Holiday Arts and Crafts Bazaar in Grosse Pointe. This will be my first time in this particular market. I have heard wonderful things about it. It is the largest show I've ever done -- featuring 200+ artists, and it is the largest and oldest art show in Grosse Pointe. Using a beautiful acrylic wool blend with sequins that self-stripes in shades from black to gray to white and back again, I made this "checkerboard"-effect crocheted infinity scarf. It can be worn long, or doubled around the neck. In addition to selling my creations locally this holiday season, as well as in my Artfire studio on the internet (Black Friday and Cyber Monday free shipping special going on right now), I am also focusing on buying local. I've been trying to do that more throughout the year. As American consumers, we are so focused on price and getting bargains, that we often forget to think about how our purchases affect the local economy and those who make the items that we buy. Here in Michigan we are lucky. Our State offers a plethora of locally grown, produced and manufactured products to give as gifts or to buy for personal use and consumption throughout the year. An added bonus, at least for me, is the feeling of connection I have to the people and places from whom I make my purchases. For example, it is a good feeling to be able to take a half-hour drive and see the cows that produce the milk I drink every day! I could go on and on. I've made a commitment to try even harder this year to purchase Michigan-made items -- the quality and variety is amazing, and it is good for my family and my community. 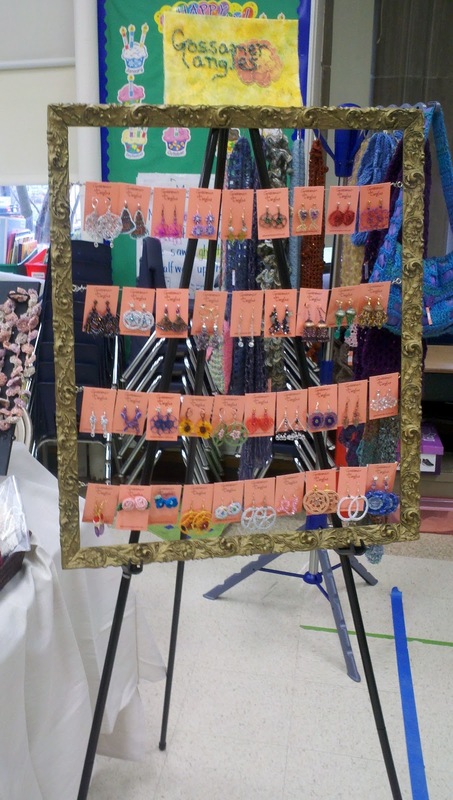 Yesterday, Gossamer Tangles was showing, telling and selling at the Lindbergh Holiday Boutique. 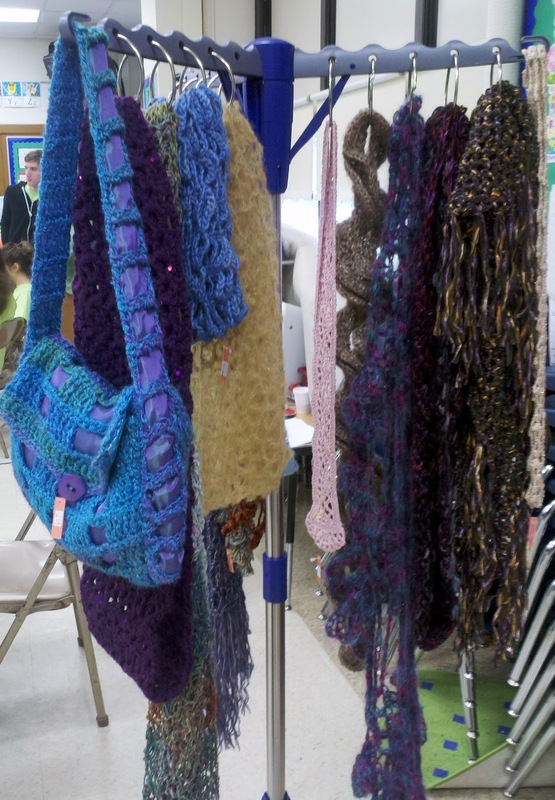 This holiday-themed, juried arts and crafts fair is held annually as a fundraiser for Lindbergh Elementary School in Dearborn, Michigan. This was its 40th Anniversary! Two of the artisans participating in the show had actually been there all 40 years! Even though it didn't feel much like Christmas (with temperatures in the 60's), holiday spirit was high. The children who acted as "angel" volunteers, getting food for artisans, helping them set up, helping them carry things to their cars, etc. were especially wonderful! You can see more photos from the boutique on the their facebook page. One of the artisans with space near mine was an amazing soap maker, local to Dearborn, Marcia Makowski. She and her husband learned soap making at Greenfield Village. They hand craft wonderful soaps, using pure, natural ingredients -- many of the herbs coming from their own garden. The name of their business is Saponify Herbal Infused Soaps. I bought a bar of their Chamomile soap, which also contains neroli essential oil, and used it this morning. I love it! 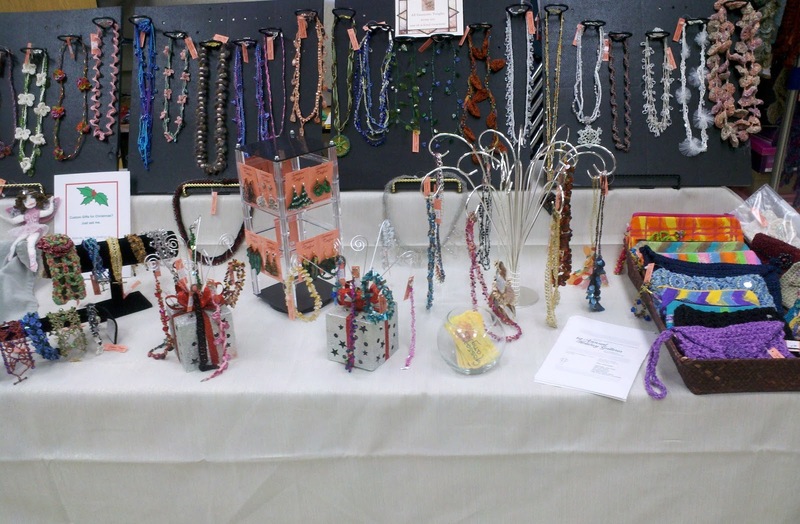 Next Saturday, Gossamer Tangles will be at a very new show, the first annual Holiday Galleria at the First Presbyterian Church of Dearborn, 600 N. Brady. 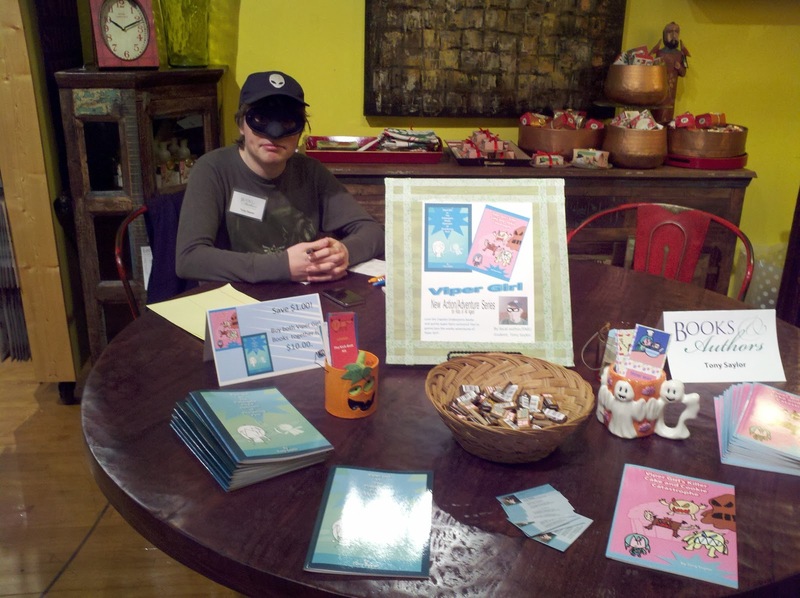 Tony enjoyed a fun day, promoting his two Viper Girl books: Viper Girl vs. The Poltergeist Pirate Opossum of Plundering Peril and Viper Girl's Killer Cake and Cookie Catastrophe. The Books & Authors event benefits The Detroit Free Press' Gift of Reading campaign. This week I've been trying to make some headway in creating some new items to offer at the holiday sales I have coming up in November and December, as well as in my Etsy and Artfire stores. Next Saturday, November 10, I will be at the Lindbergh Holiday Boutique in Dearborn, Michigan. This year is the Boutique's 40th Anniversary. The following week, November 17, I will be at a brand new show, The Holiday Galleria at the First Presbyterian Church of Dearborn. They are going to have some great raffles featuring items donated by artisans and vendors participating in the event. For the next few weeks, most of my posts will probably be focused on showing new items as I am creating them for holiday sales ... but hopefully I will have time to take you on a few detours along the way.